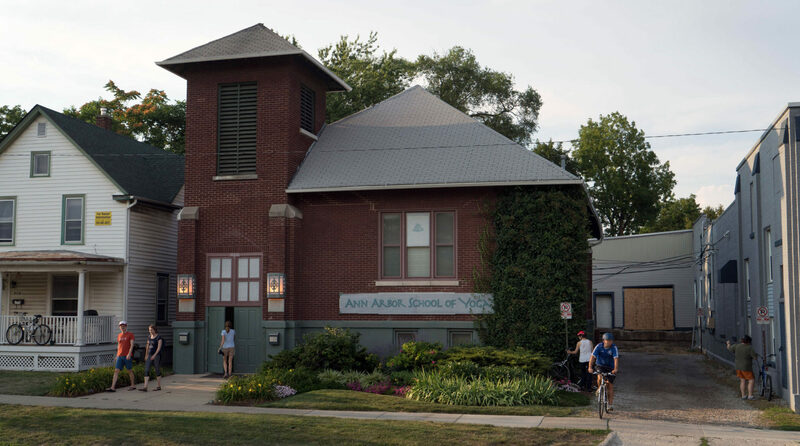 On Saturday, April 22, 2017 the Ann Arbor School of Yoga celebrated its 10th anniversary with a party. Each Spring Laurie celebrates the schools anniversary with food, art and entertainment. This year the food came from Jerusalem Garden, the cake from Zingerman’s, the art was Quilts by Pat Holly and the music was Indian Fusion played by John Churchville’s group, Sumkali. 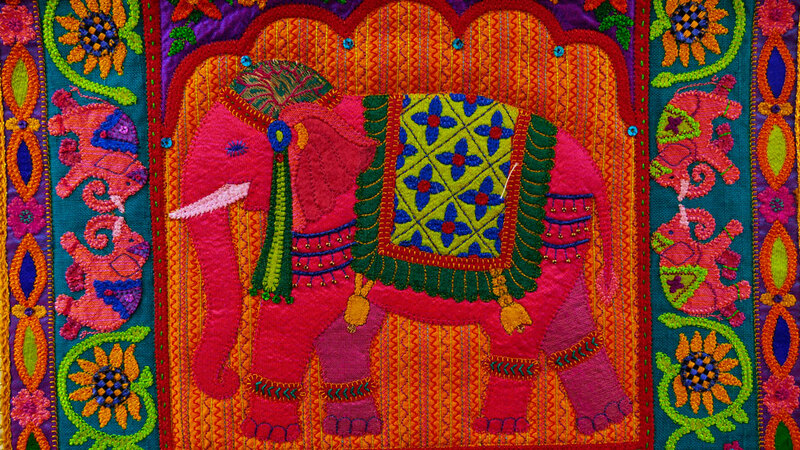 The Asana hall was decorated with large quilts and Indian fabric. Laurie greeted everyone and led the Invocation to Patanjali. 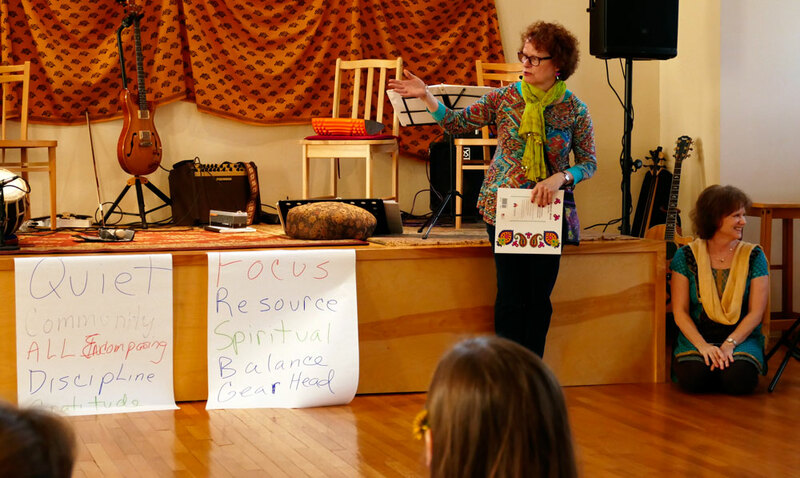 She then produced an easel and a marker asking the group for suggestions describing what yoga has meant to them. The responses were: Quiet, Community, All Encompassing, Discipline, Gratitude, Focus, Resource, Spiritual, Balance and Gear-Head. A woman drew applause using all the words in a sentence right away. Laurie introduced this years exhibiting artist, Pat Holly, who spoke to us briefly about her works. Then we headed down for dinner. The entry passage downstairs had more small quilts which were beautifully intricate and colorful. 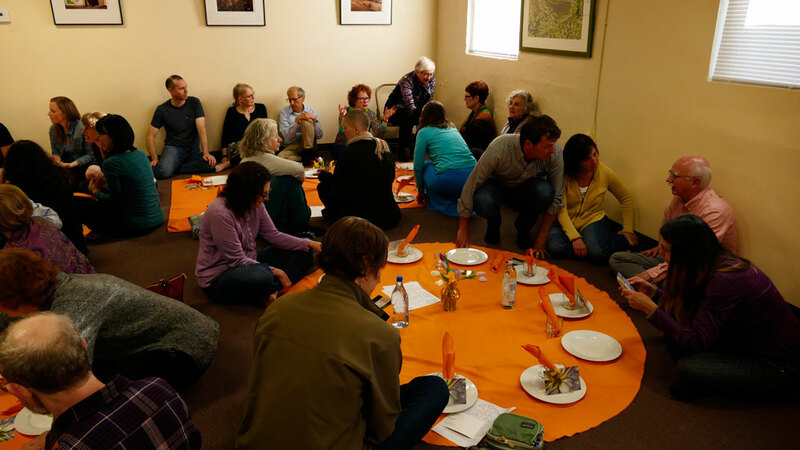 Diners enjoyed falafel sandwiches, hummus, pita bread and salad. A large cake for dessert was off to the side. Students, instructors, family and friends, and the musicians who’d play later, all ate together. The room rang with chatter and laughter. When it was time for dessert the cake from Zingerman’s garnered a LOT of attention. A trained panda would not have enjoyed a more attentive audience. 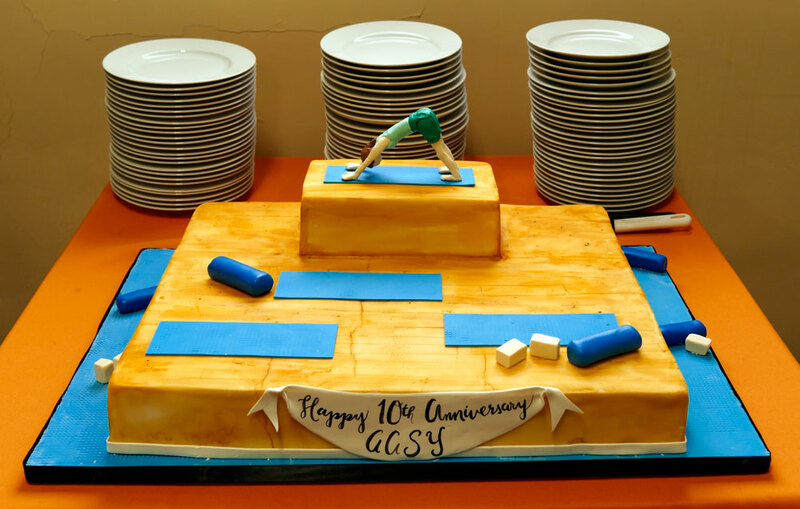 The cake perfectly depicted the practice room upstairs, in detail, complete with wood floor, teaching platform, and a human figure executing Adho Mukha Svanasana (downward dog pose) on top! Yoga mats, blocks, and bolsters rendered in sugar were present and the teaching figure looked a lot like Laurie! It was almost a shame to cut into the cake. Almost. While the guests finished dinner the musicians went upstairs to prepare for their performance and were playing their welcome music when the congregation headed back upstairs into the hall. The 5 Piece Group, Sumkali, led by John Churchville, played Indian Fusion Music using the teachers platform as a stage. Large beautiful quilts hung to each side of the stage and fabric draped the wall behind the musicians. The lights were dimmed except for the stage. Perfect. The group performed as a 5 piece with Tabla, Violin, Guitar, Bass, and a Vocalist. They played one piece that used the Beatles “Come Together” as a theme in the middle. Fusion indeed. Mr. Churchville said Musicians enjoyed playing to an audience interested in Indian culture and really enjoyed playing in the great room. The band played 9 songs that went by all too quickly. Party guests helped clear the great room as they do after every yoga class and the evening was complete. Previous PostPrevious Review, Reconsider, Reflect!